At Slo Living Hostel, our first objective is to meet your needs and to offer you a range of quality and innovative services. Today we are pleased to offer you a mobil WiFi service available 24h/24 and 7/7 at the reception of our hostel. 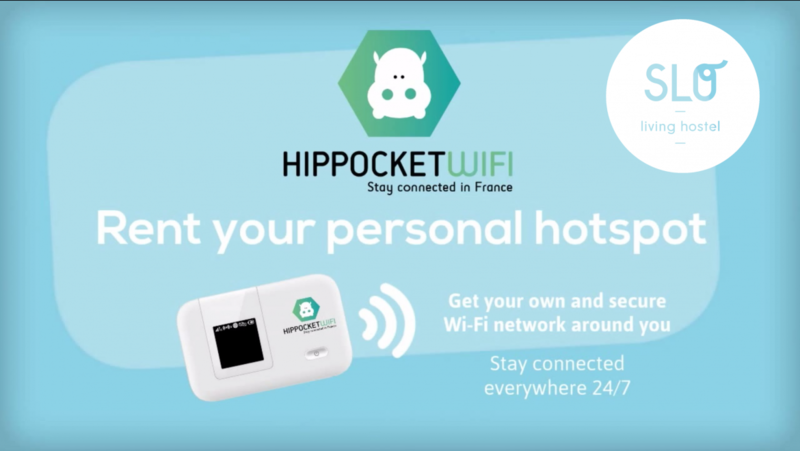 The SLO LIVING HOSTEL partners with HIPPOCKETWIFI to offer you a mobile hotspot service, easy to use and fits in your pocket to enjoy unlimited Internet access throughout the city of Lyon. The pocketwifi comes with an AC outlet, a USB cable and protective cover. Battery is up to 6 hours operating time with debit of 100 Mb/s. Easy to subscribe! Come directly to our reception, sign your lease and leave immediately your Hippocketwifi. For good addresses, visit our City Guide Lyon to discover Lyon like a local. The introductory offer is 4 euros per day!